Nerds Ropes are an awesome candy. 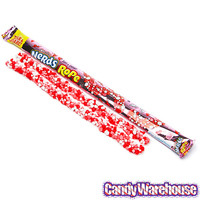 You have a long chewy licorice rope encased in yummy nerds candy. It is like two candies in one! So for this candy, we had to start with the rope. That was easy with TFA's Red Licorice. Next we had to figure out what to do about those nerds! What are nerds really? Nerds are the essence of skittles but without the chewy insides, and that is where the rainbow drops come in. You have to be careful with this flavor though, because if you use too much, it turns into lemon pledge (Like so many fruit loops recipes). The insides are rather a different story. The insides are more like smarties candies, which is where the Sweet and tart comes in. The flavors work, they are accurate, but they are a little rough on their own. This is where the dragon fruit comes in. If I had the luxury of a fifth flavor, I would have kept the dragon fruit at .25% and added 1% of Tfa Meringue to both emulsify and smooth things out. As I am allergic to all artificial sweeteners and that fifth flavor is not an option, I had to work a little magic. I bumped the dragon fruit up to 1%, and was thrilled to find that the mix was just as good as the .25% dragon fruit/1% meringue option. This recipe is the property of Chapel and released under the CC Attribution-Noncommercial 4.0 license. You may not copy, derive or commercialize this recipe without following the terms of this license or the explicit permission of the creator. Everything Jthectic said in their review. Excellent recipe, definitely give it a try if you like nerd ropes or candy vapes in general. Tastes like the real deal. Real nice nerds flavour and texture of the rope. The sweet and tart really brings the mix together with a satisfying albeit chalky (sorta similar to the nerd rocks themselves when you chew them up) texture. Great mix, ADV territory.